As I got off the train at Victoria on my first day at the new job I tried to embrace the role of being a London commuter rather than casual visitor. After brazenly holding up my season ticket for the first time, level with the eyes of the ticket barrier man, I then waltzed through with a brashness I thought befitting of someone in the know. Victoria concourse is always a bit of an assault course to get through but I weaved my way through in nonchalant fashion. In the middle a gaggle of brightly clad people were thrusting yellow packets at passers-by. Usually, I take a swift glance at such freebie advertising and pass by empty handed. But this time I put my hand out and accepted the gift – seeing it as part of my new act. I put it in my bag and then forgot about it. A couple of days later I was rummaging in my bag for a pen and noticed the yellow packet. I took it out and read the label “guzzle puzzle: what’s your fruity formula?” I ripped the packaging open. 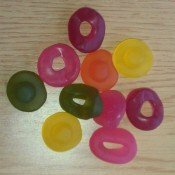 Inside was an assortment of strangely shaped and assorted coloured jelly things – some rings and others in the shape of plugs. The secret is to mix and match the two – placing a ring on top of a plug – to create your own fusion of flavours. The red (raspberry) and the green (lime) when mixed are meant to create ‘pink lemonade’ flavour. The orange and yellow (banana) turn into bubblegum and the green (lime) and the dark maroon (cinnamon) into cola. I got my researchers to come and experiment with them, combining green and maroon plugs and rings to see if they were able to taste the ‘real thing’. There were not enough of the sweets to do a more thorough blind-fold study but they did think they were chewing on cola. Who ever invented the idea of transforming coloured fruit flavoured candies into fizzy drinks had a streak of creativity in them. Not sure, though, about the process of putting a ring on top of a plug or vice versa.